in my studio | chocolate, kit kat & M&M cake! 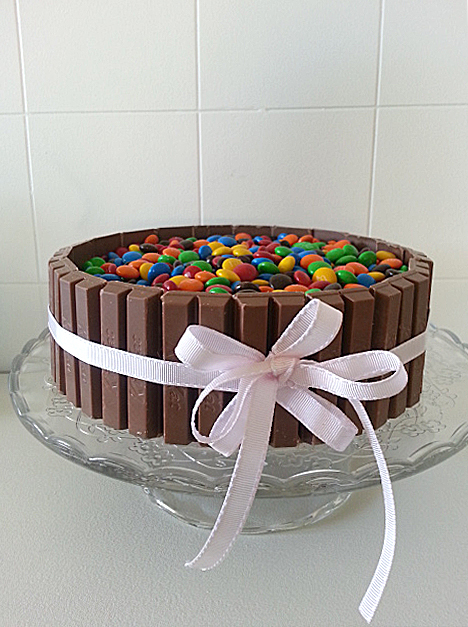 chocolate, kit kat & M&M cake! Oh-do I feel like a child again! Over the weekend, my inlaws threw a surprise farewell party to my Sister in Laws daughter-who is only 8-and going to Dubai! I was so excited to be given the task to make a Kit Kat cake as I’ve always wanted to make something like that but did not want it to make it for no reason. I have to admit, it was so hard resisting myself from eating the kit kats and M&Ms whilst I was constructing the cake, I felt like a kid! I apologize that I do not have a photo of the cake cut so you can see what its like on the inside. It was gone by the time I even had a chance to take a photo! 2. Line the base and sides of a 20cm diameter springfoam tin with baking paper. 3. Sift all the dry ingredients into a large bowl. 4. Pour all the wet ingredients into another large mixing bowl. Beat with an electric mixer until combined. 5. Then gradually add the dry ingredients into the wet bowl. Fold until well combined. 6. Pour batter into the cake tin and bake for 50-60 minutes until a skewer inserted comes out clean. Adapted from my own memory and taste! 1. Using a stand mixer, whisk the butter and sugar until well combined and smooth. 2. Gradually add in vanilla essence, milk and cream. 3. Whisk on medium to high for a few minutes until silky smooth.